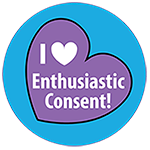 Spread the word about consent in style with this 1.5″ standard steel pin back button that says “ask first” on a rainbow geometric background. 1.5″ Button with “ask first” written in white on rainbow geometric pattern background. The inner rim says “Communicate. Negotiate. Participate.” The back has a standard steel pin closure.